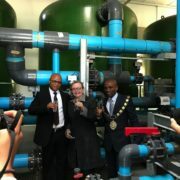 Western Cape Premier Helen Zille has lauded the design and management of Bitou’s desalinationn plant. The Premier was in the area on Thursday, 23 November, to speak at the Southern Cape Landowner’s Initiative’s Environmental Seminar 2017, and to inspect projects related to the Garden Route Rebuild Initiative. Talking about drought mitigation measures in Bitou, she said, “the Roodefontein Dam is currently 72% full, and augmentation schemes in this municipality include equipping two new boreholes in Kurland, four in Kwanokuthula, and four in Uplands. “The drilling for these boreholes has already commenced, and we’re also planning two additional boreholes in Harkerville. After inspecting Plett’s desalination plant, the Premier met with the town’s political and administrative leadership in the council chambers. “It was amazing to see a desalination plant in that beautiful location right next to the lagoon, and to see the technology at work,” she said. “What’s was even more amazing for me was to see how you have resolved major technological problems that have been worrying – for example, the way you handle the brine that can be toxic if it’s dumped near the coastline. Here what you do is you is to send it out in plumes so that the wind blows it around, and the wave action then churns it so that the absorption has no impact on the ocean. “This is exciting because it may be a technique that we can use elsewhere in the Province, rather than spending millions on pumping the brine far out to sea. “I was also fascinated to hear that you’re extracting water from a well-point in the lagoon – because everything I’ve heard and read about desalination says that you have to extract the water from a clear place in the open ocean. “But here you’re allowing the sand to do half of the work for you by filtering it first, which also saves a lot of money – as does your use of a turbine that saves 40% on your electricity bill,” she said. “I’ve been very impressed, and I’ve learned a lot technically,” said Premier Zille. 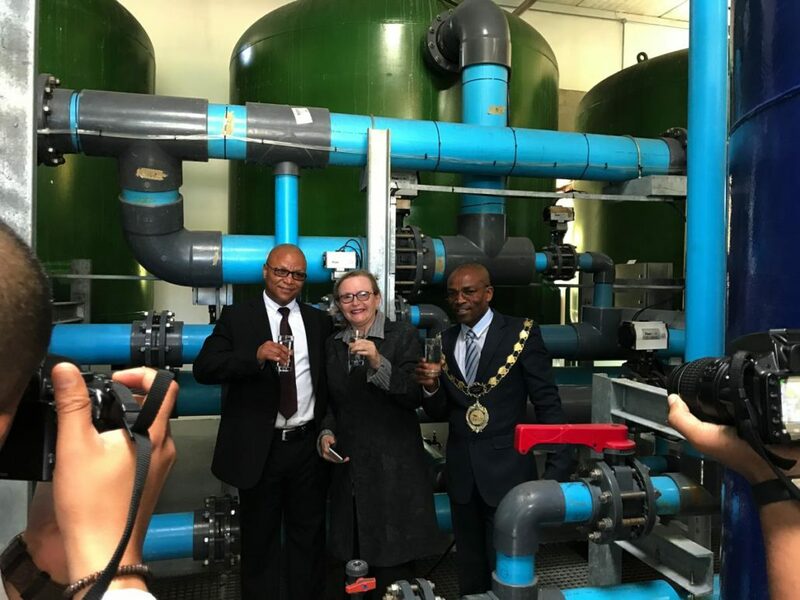 IMAGE: Bitou Mayor Peter Lobese, Premier Helen Zille, and Eden District Municipality Mayor Memory Booysen tested the water at Plett’s desalination plant on 23 November.